RC Electric Motors: The types of electric RC motors available . How to select the best RC electric motors for your application and descriptions of the brushless RC motors available today. Maybe the first thing to clear up is the difference between a model aircraft ENGINES and model airplane MOTORS. Engines generally refer to the various types of internal combustion ENGINES available, whereas the term MOTOR is usually reserved for ELECTRIC motors. For further information on RC model airplane ENGINES, visit this page. To understand how conventional "canned" model airplane motors work, please take a look at the How Stuff Works website. They have an excellent description along with some good graphics and photos. I have taken the liberty to include some of their photos here. Basically all motors are powered by permanent magnets and electromagnets. 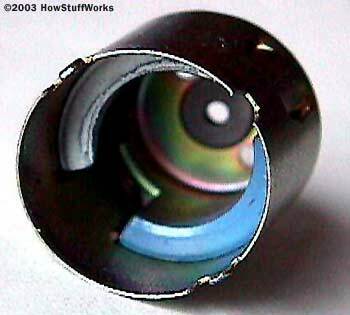 Here you can see 2 permanent magnets ( of opposite polarity i.e. north and south) mounted inside the can of an RC electric motor. 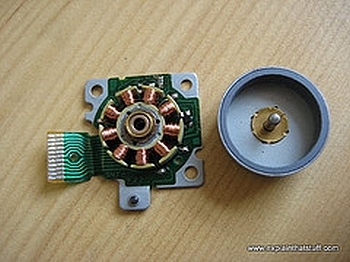 The arrival of the computer and high power transistors has led to the development of the brushless RC motor. 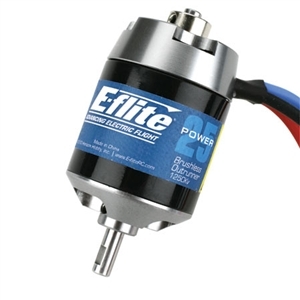 The modern brushless motor is more efficient and longer lasting than it's predecessor. The BIG difference is that the electromagnets are stationary and the permanent magnets rotate. 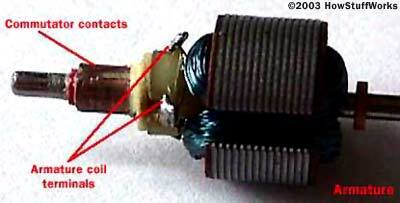 The photo shows a brushless motor from a computer floppy disc drive. Note the stationary electromagnets mounted on the PC card, the housing with the permanent magnets mounted inside and the shaft attached in the center. The armature (stationary electromagnets) is controlled by the computer ( or in our case the ESC or Electronic Speed Control). This makes for a far more efficient RC electric motor and there are no brushes to wear out or to create friction on the rotating parts! Note that this motor is an Outrunner. The permanent magnets are mounted on the shaft of the brushless motor and the electromagnets are mounted on the inside of the can. Inrunners are generally mounted to a gearbox, to reduce speed and increase torque. The photo at right shows a typical Outrunner brushless motor. They are available in a wide range of sizes, to power the lightest of indoor RC airplanes to the biggest of the giant scale RC airplanes. 1. Power can be measured in WATTS. Note that 1 horsepower=746watts. 2. Watts can be determined by the formula-Watts=Volts x Amps. 3. The power requirements of an RC airplane can be found below, using the total flying weight of the RC plane. 50-70 watts/ pound; Minimum level for reasonable performance. Confined to lightly loaded indoor RC airplanes and small park fliers. 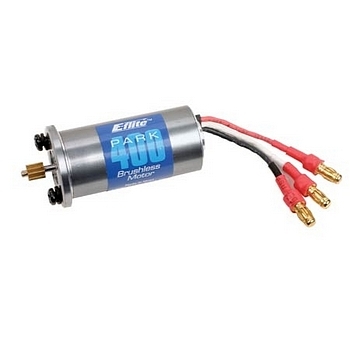 70-90 watts/ pound; Beginner RC airplanes and slow flying scale model aircraft. 90-110 watts/pound; Sport RC aerobatics and the fast flying scale RC plane. 110-130 watts/pound; Advanced RC airplane aerobatics and high speed RC airplanes..
130-150 watts/pound; Lightly loaded 3D electric RC planes and the electric ducted fan. 150-200+ watts/pound; Unlimited performance 3D models. 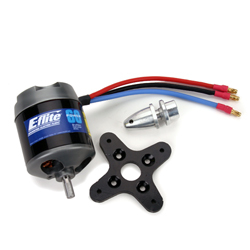 Note these guidelines come from the E-Flite website and are based on the parameters of E-Flite RC electric motors. 4. Find the input watts/pound required to achieve the required performance. Example model. Hanger 9 P-51 Mustang. Required performance: 90-110 (100 average) watts/pound for a fast flying scale model. 9.0lbs x 100 watts=900 input watts minimum. 5. Find a suitable motor. For E-Flite motors this chart is useful. From the chart the Power 60 is listed as 1200watts of input power, and a continuous current of 40 amps with a max burst current of 60 amps. The number of Li-Po cells is 5-7 and the Kv rating is 400. The average voltage of a 3 cell Li-Po pack is approximately 9.9 volts. So if we assume 6 cells the voltage will be- 6/3 x 9.9 volts=19.8 volts. 6 cells, Max burst power capability=19.8 volts x x60 amps=1188 watts. Motor rpm=Kv=400 x 19.8 volts=7920 rpm. So for this example. the Power 60 motor with a 6S Li-Po pack is a good selection. Of course the battery selected must adequately supply the current required and good throttle management and cooling must be utilized. 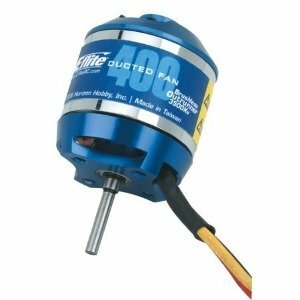 The power 60 motor is in stock.